Genesis, Hyundai’s new luxury brand, recently launched the third member of its lineup, the 2019 Genesis G70 luxury sports sedan. It’s a wonderful car, but its presence orients Genesis’ current trajectory eerily in the direction of Cadillac’s: heavy on sedans and too light on the SUVs and crossovers that everyone is actually buying. Despite being thrilled about a new, enthusiast luxury sports sedan, I also couldn’t shake off wondering why. Why would a fledgling brand like Genesis release a luxury sports sedan, aimed directly at the Europeans, now? Take into account, for example, that Ford just recently made headlines with the announcement of its decision to phase out sedans over the next few years. And how Cadillac will axe the ATS sedan. And how, two years ago, Fiat Chrysler decided to kill off the Dodge Dart and the Chrysler 200. Even sales of stalwarts like the Toyota Camry and Honda Accord are slower than the bigger crossovers like the RAV4 and CR-V. Yes, some of those aren’t exactly the sedans that the G70 will compete with, but SUV demand is high across the board. A look at last year’s best selling cars in the United States on Good Car Bad Car will show that the top five best sellers were a truck, a truck, another truck, a crossover and a crossover. For now, though, a good 3 Series-sized car can still do well if it’s done right. “In terms of volume, the near-luxe segment is the biggest segment in the luxury segment in the U.S,” Genesis Global Brand Chief Manfred Fitzgerald told me. And he’s right: Last year, both Mercedes C-Class and BMW 3 Series sales exceeded their luxury SUV/crossover counterparts. But these are luxury sedans that already have an established presence. It’s tough to say how much of that presence directly translates to sales, but it’s a segment that the Germans have owned for a very long time. Drawing customers away from them will be no easy job. It’s something that Cadillac has been attempting to do since 2014 and 2015. Armed with a handful of sedans, lots of money and energy to devote to a splashy PR campaign and not enough SUVs to satisfy the global hunger, Cadillac couldn’t score enough sales and, eventually, its president, Johan de Nysschen, bowed out because the brand just couldn’t play SUV catch-up quickly enough. Genesis is doing much of the same thing that Cadillac was doing: Targeting an already very competitive and saturated market. It’s working hard to depart from the Hyundai image; in part, also, by revamping its dealership network. At first, Hyundai decreed that its Genesis cars would only be sold through a select number of dealers, but then changed its mind. Now, the new dealer plan is that Hyundai will offer its dealers that currently sell Genesis models to either stop selling the cars or to be come a full Genesis dealer. 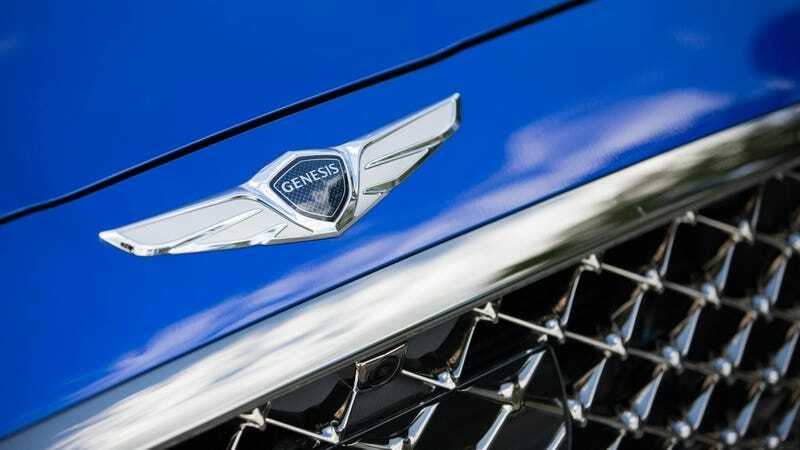 “Independent Genesis retailers will need to develop a standalone facility, per our original announcement, in order to sell MY19 Genesis models and beyond,” a spokesperson clarified to us back in May. It also doesn’t help that the Genesis’ beginnings are muddled. The G80 was formerly the Hyundai Genesis sedan. Then you also had the Hyundai Genesis Coupe, which Hyundai killed in 2016. This naming sequence was very confusing. Genesis was officially announced as a standalone brand in 2015. Yet, I still had readers tell me that wasn’t right, since they are driving a 2009 Hyundai Genesis. Technically, yes, they are driving a Genesis, but they’re driving a Hyundai, not a Genesis Motors car. I don’t blame them for the mix-up. This could have something to do with the differences in the luxury climate between South Korea and the United States. During the G70's media drive last week, Raphael mentioned that having a standalone luxury brand is a uniquely American concept, whereas in Korea, it was apparently acceptable to have a model, even if it wore a Hyundai badge, as your luxury car. That would explain the existence of Infiniti and Lexus, anyway. I’m speculating here, but I suspect that the South Koreans are still grappling with how to deal with new realities in the American market, specifically since we all started going insane for crossovers. The Hyundai brand has definitely had that problem here as of late. Perhaps that’s why the G70 wasn’t even launched here, it was launched in Seoul. I’m guessing that it’s a car more intended for the Korean market than even ours. It would make sense, too, because South Korea is the second largest market for the BMW 5 Series after the U.S., according to the Korea Herald. And the Bentley Flying Spur and Maserati Ghibli and Quattroporte sedan sales are strong there as well, reports Financial Times. They’re buying up luxury sedans there, there’s no doubt about that. Yet, Hyundai and Kia both missed their 2017 sales targets, writes Financial Times in a separate story. The cause? The South Korean carmakers are struggling to rev up sales in their two biggest markets, China and the US, where they have been hobbled by a lack of in-demand sport utility vehicle models. Hyundai replaced the chiefs of its China and its US operations in September as it tries to revive its fortunes in the two key markets. The company plans to expand its SUV line-up in China — the world’s biggest car market — from four to seven models by 2020 and to launch more environmentally friendly cars. With that in mind, I would also be willing to bet that the upcoming Genesis SUVs will launch in the markets that they are intended for; namely, here, in the U.S. or in China. The G70 debuted this year, but it was probably five to seven years in the making. There are SUVs coming. So, it’s too early to say whether or not Genesis will go in the way of Cadillac. I hope it doesn’t. I’m always for upsetting the established order. The day may come when gas prices spike upward and buyers rush back to smaller cars or even sedans. But the former is far more likely than the latter, and it’s not something Genesis can count on. Until then, if this brand is going to make it, it needs to rush out a balanced, diverse car portfolio if it wants to seriously be on anyone’s radar.